What Do You Want To Know About The 2017 Volvo V90 Cross Country? The year’s almost out, but I’m going to end it with a bang by bombing around Vermont in a sparkly brown 2017 Volvo V90 Cross Country, hopefully kicking off 2018 the right way. What do you want to know about it? 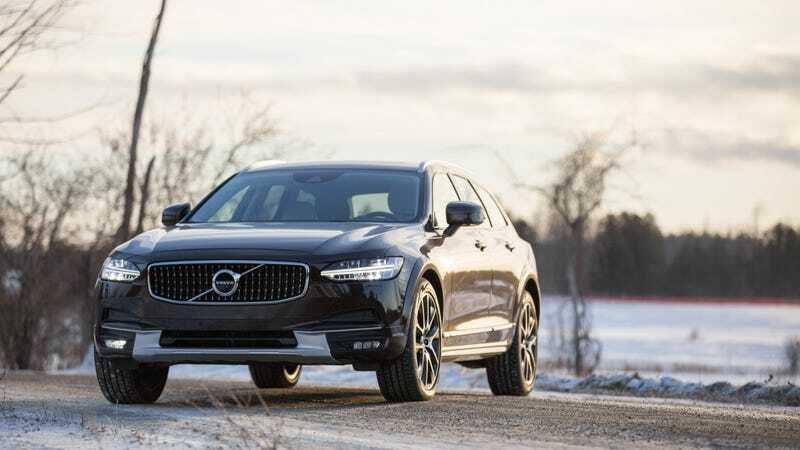 I first drove the V90 Cross Country roughly a year ago in Sweden. I remember it being very lovely, but, unfortunately, as was the nature of that press drive, I only got about an hour total in the car. I have it for over a week this time around, so I’m looking forward to seeing what it’s like to live with. It’s really goddamn cold in Vermont right now. It was seven degrees Fahrenheit today when I took the car out for some pictures; there was steam coming off of Lake Champlain because of the difference in temperature between the water and the air. But with the Volvo’s excellent heated seats, powerful climate control system and heated steering wheel, it was toasty and cozy inside while the frigid air howled about without. The seats are remarkably comfortable and the trunk swallowed up our luggage greedily. There’s ample legroom in the back for additional passengers. All in all, this press model comes to $69,440 because it has nice things like a premium stereo system, the Luxury Package (which includes massaging front seats) and a $595 metallic paint job. I have access to a Golden Retriever and a Jack Russell mix while I’m up here, so I will be investigating how the wagon dogs as well.